On the initial viewing, I ranked it right up there with T-Mac and the greatest off the glass (or whatever that backboard is made out of) dunks ever. I know a bunch of people are going to say this didn’t happen in a NBA game and I’ll point out that many of the most celebrated off the glass dunks happened in a NBA All-Star game, where there’s less defense than a typical run with Bengay-smelling, hook-shot taking, extra-pass making white guys at a YMCA. On second viewing, I noticed the dunker got a little boost. I still think it’s a great highlight but it drops it off my Top 10 list. 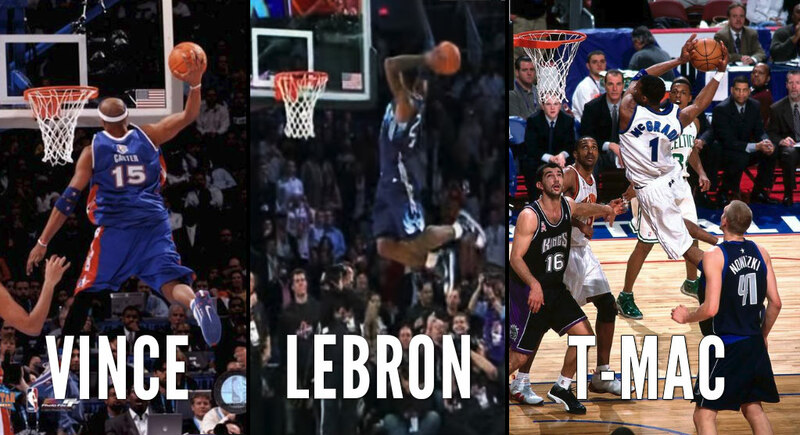 With that said, let’s get into this Top 10 compilation video of those best dunks with Javaaaaale McGee, King James, his buddy D. Wade, his Finals nemesis Iggy, the guy we wanted to be a LeBron’s Finals nemesis, and lots of Tracy McGrady and his cousin. M.I.A from this compilation is LeBron’s head at the rim dunk from the 2009 All-Star game. Also messing from this list is Jordan Bell’s controversial dunk that happened during the final minutes of a blowout victory against the Mavs. It’s not that great of a dunk but it was the most talked about example from this past season. And Bell was the first Ballislife All-American Game MVP so I had to find a way to give him a shout out. That dunk by Bell is featured in the following compilation video of just off the backboard oops.